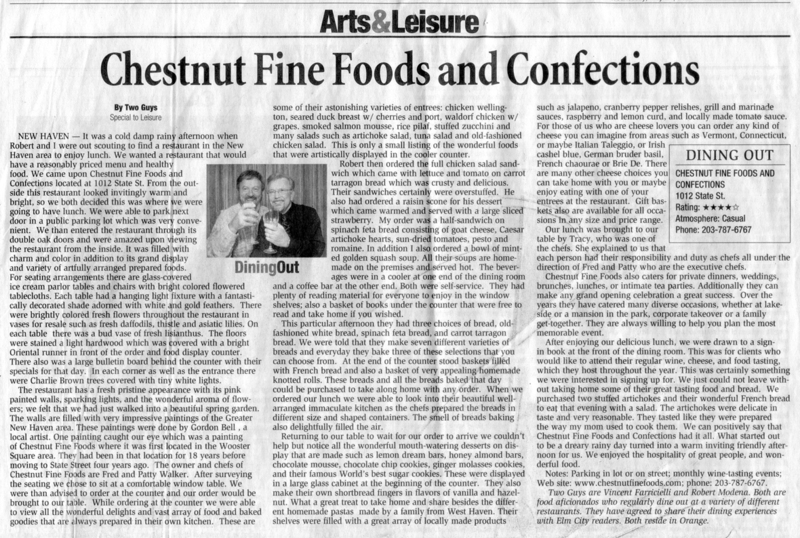 Chestnut Fine Foods has been catering for more than 30 years to Foodies of all tastes and pocketbooks. With daily prepared gourmet foods, artisanal breads, desserts, a fabulous cheese assortment and an intimate cafe. We look forward to each opportunity to create something new and share this with you. Over the years we have catered many diverse occasions, whether at a lakeside resort, a mansion in the park, a schooner race to the Bahamas, a loft in Manhattan, a corporate takeover or a family get-together, they have all been special to us. We love what we do and look forward to helping you plan your most memorable affair. We will be hosting wine, cheese and food tastings throughout the year, please call about dates and info; or stop by to sign up, as parties are limited. The menus and food items in this catalogue are just a small sampling of the many options and catering services that are available. We’d be delighted to help with rental equipment, waitstaff, flowers, or any party arrangements that might make life simpler. Call us, we love to talk food.